The various royal Licences offered for sale via eBay have been in the form of a Letters Patent signed by two or more Kings of Arms. The RL for Francis Ignatius Ricarde to take the Name and Arms of Seaver is quite different. It is presented in a blue Morocco folder. 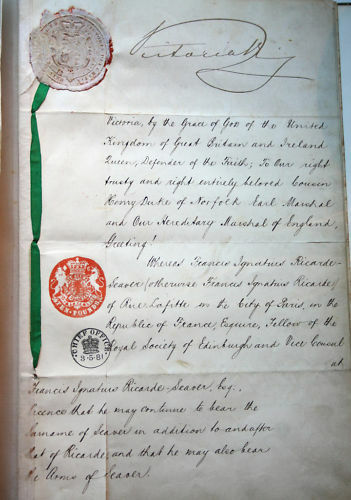 The Royal Warrant signed by Queen Victoria and Henry Murray-Lane, Chester Herald. Victoria, by the Grace of God of the United Kingdom of Great Britain and Ireland Queen, Defend of the Faith; To our right truly and right entirely beloved Cousin Henry, Duke of Norfolk, Earl Marshall and Our Hereditary Marshal of England, Greetings. 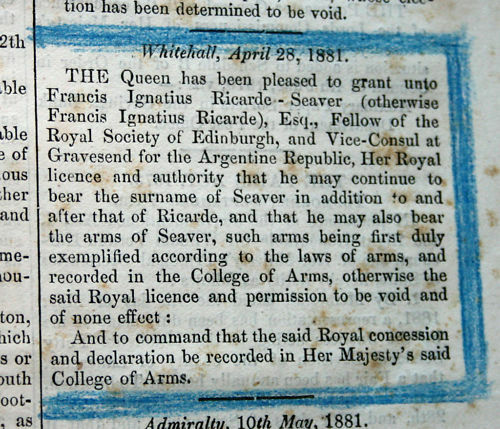 Francis Ignatius Ricarde-Seaver, Esq., Licence that he may continue to bear the Surname of Seaver in addition to and after that of Ricarde and that he may also bear the Arms of Seaver. 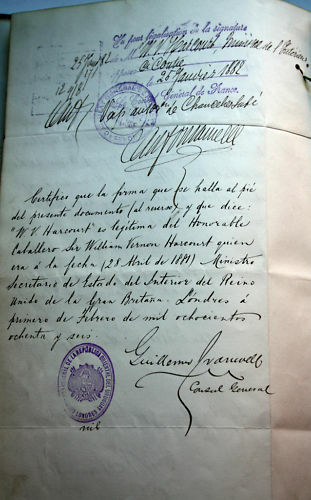 A document signed by both the Consul Generals of France and Portugal. The edition of the London Gazette containing the announcement of the Royal Licence. 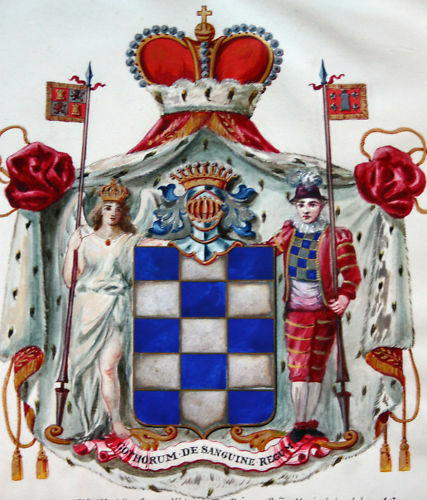 The Arms of Seaver and those of his wife, Her Serene Highness the Princess Dona Maria Louisa Christina de Looz et Corswarem. From the photographs available it is not possible to see the blazon. However, some details are included within Fox-Davies’ 1929 edition of Armorial Families. Arms: Azure a chevron embattled between two wreaths of oak in chief Or and a pickaxe and sword in base proper surmounted by a tower Or. 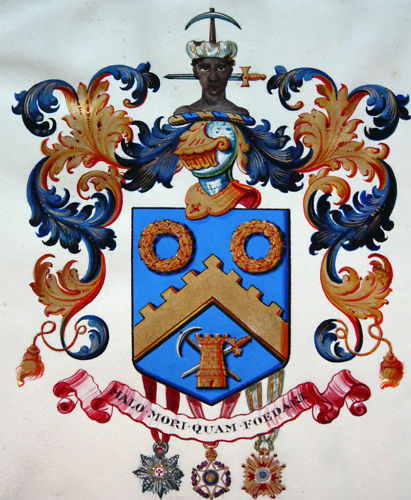 Crest: Upon a wreath of the colours in front of a pickaxe erect a Moor’s head affrontee couped at the shoulders proper the turban Argent pierced through the head by a sword fessewise point to dexter also proper. Motto: Malo mori quam foedari. It seems that the Princess was Mr Ricarde-Seaver’s second wife and that she had died in 1880. 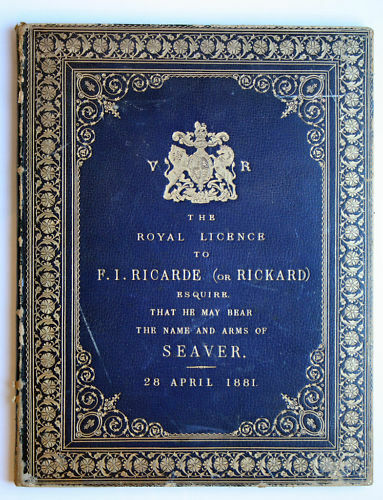 His only son, by his first marriage, was Marmaduke Francis Julian Ricarde-Seaver died in 1928. Bidding started at £29.99 and sold for £467.99.